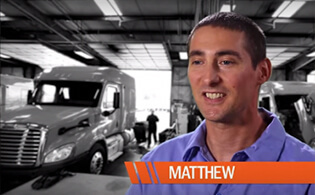 Schneider invests in our maintenance team and creates a culture that fosters career growth. We want you to be as excited about your career path at Schneider as much as we are! Check out our maintenance opportunities below and join the Diesel Mechanic team today. Schneider offers a wide range of diesel mechanic opportunities in our nationwide shop network. Work with a proven company that takes your safety and career growth seriously. The Assistant Diesel Mechanic provides hands-on support to mechanics such as executing tire changes, along with electrical and accident repairs. In this role, you will perform various tasks, including general shop duties, routine part pick-ups and stocking, inventory management and tracking repairs. Schneider Senior Diesel Mechanics handle all major repairs on our fleet of over 10,000 tractors and 37,000 trailers. It’s a big job, which is why we need professional, skilled diesel mechanics on our team. If you have three or more years of experience as a fleet or diesel mechanic, our Senior Diesel Mechanic role is a match for you! Learn more about Becoming a Senior Diesel Mechanic. Want to be a truck driver’s on-the-road hero? Schneider’s Service Truck Technicians perform on-site maintenance. This may include anything from tire changes to accident repairs. In this role, you will make smart decisions to maintain the safety of our team and equipment, utilizing our software to track your maintenance successes. Are you aspiring to be a leader of the pack? If you have goals of working in a shop management position, our Shop Floor Leader would be a smart career move. In this role, you’ll assist in managing the shop in an effective and efficient low-cost manner, while learning best practices of how to manage an industry-leading maintenance team. With company-paid training at your fingertips, you can stay on top of your game or work your way into something new. Pick a place to start; then grow from there!